This article contains shocking photos of the massive head injuries inflicted on Rudy Delgado, a Texas inmate. He was beaten to death on May 28th 2000 in one of our American prisons, a carnage that didn't take place on a Normandy beachhead, but in a "controlled and supervised" institution. We would like to see an even uglier picture.... a photo of the monster who did this to Rudy. And if we do see such a picture, we'll wonder how such an average-looking man could do such a thing. But inside this man, if we could glimpse it, is a most horrible entity. Much more repulsive than any alien creature you've ever seen in the movies, it can be described as violent, cruel, sadistic, murderous and a destroyer of man's body & spirit. Questions: Why was such a creature unleashed on Rudy Delgado? How in the world could this happen without anyone's knowledge in a confined space, supposedly under constant surveilance? Is it allowed or is it just taken for granted? Answers: Ask an inmate. Fear is paramount. It's apparent that the people who run our prisons are not fearlessly human enough to jeopardize the status quo, or assume responsibility for such crimes. Taking it a step further, our countrys leaders are fearful of changing the prison system, of invoking stronger rules, pressing for more stringent hiring policies in employment of guards and supervisors. Sadly, the current movement for privatization of our prisons will all but destroy this hope, and it's a growing industry that will ultimately insulate the prisons from any human rights interdictions if we allow it to continue growing. Now ask a person, a citizen. They'll tell you we needn't be soft on inmates, but we should be responsible for their safety if they are in our custody. No excuses, no exceptions. So ... Read on. 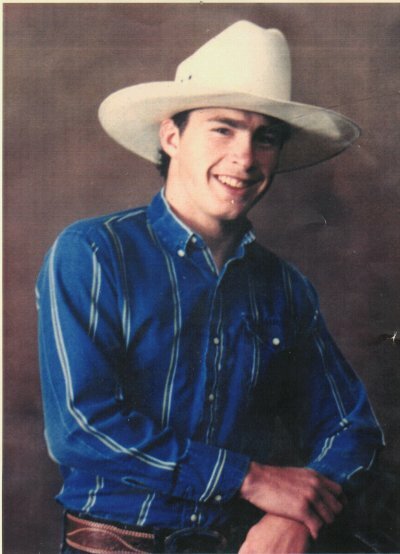 Read about just another guy who broke the law and was incarcerated. Must have really pissed somebody off you say ... Otherwise, why would Rudy be dead? Unrecognizably dead. I'll tell you what ..., I am the one who is really pissed off! I didn't know him from Adam, but it happened in MY country. Under my nose ... And MY employees are getting away with murder! Rudy Delgado's body was misplaced by TDC for almost a week. At the family's insistence and with the help of a funeral home here in Dallas, the body was located and brought back home. Photos were taken by the horrified funeral director at the family's answer of why Rudy's casket could not be opened at his funeral. There is no explanation of how Rudy died, or at whose hands, or what was used to kill him. Please pass this along to anyone you can and the photos too. Rudy's face was disfigured to the point of it was hard to even tell his face from the back of his head. 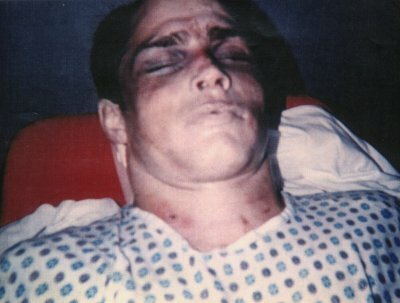 The first photo shows that his face was ripped off his skull, only his throat is visible. His face was sewn up to attempt to make him up but they gave up. One of his eyes was not even located. He was forty years old. His family only received this letter from the chaplain who they figure is only trying to get some kind of word to them. But who is to blame? What can the family do to right this wrong? Where was the supervision? They want names and faces to come forward and help them, not hide from them. Mrs. Delgado, On behalf of Warden Cooper, the administrative staff of the Barry B. Telford Unit, and the Texas Department of Criminal Justice, allow me to express our sincere condolences to you and other family members in regards to the death of your nephew, Rudy. I know that it is painful to accept and believe the news at first, but death is rarely easy to accept. We realize our life here, and in eternity, is in the hands of a just God. May the God of peace comfort you and yours during this of hour of pain. In Psalm 23 we find this Great God of heaven is our most reliable source of comfort during a time of grief. So, lean on Him, and He will carry you through. Once again, on behalf of the Texas Department of Criminal Justice and the administration of the Telford Unit, please accept our condolences. Our thoughts and prayers are with you during your time of grief. If I can be of any further assistance or per chance if I may answer any questions that may arise, please do not hesitate to contact me. May God bless and strengthen you in your time of need. Hello there Ms. Delgado. I know you may not remember who I am, so please let me introduce myself to you. This is not very easy for me to write, but I feel like it needs to be done. I knew Rudy and I used to make sure he had food to eat when I had it and I would make sure he had hygiene items. Rudy was a good person and I enjoyed knowing him very much. He loved you all so very very much. There are things about him that you all do not know yet, but you need to know. I need to tell you that I was locked in my cell and could not do anything to help Rudy except to scream out for this other person to stop! I know and understand that this is not an easy time for you and your family over the loss of Rudy. I hope that I will get a chance to talk to you and to meet you and talk to you about some things he had to go through in here. But remember this.he always loved his family and he always spoke of going home. He wanted so badly to be able to hug his sister again. He was very grateful that yo all took flowers to his Mother and Dad's graves for him. This was a horrible and senseless tragedy - it should not have happened. I knew both Rudy and the man that killed him. I am greatly saddened by the loss of Rudy. It will take some time to heal your wounds. God Bless Your Family, A fellow inmate at TDC living in fear here. I've had a lot of requests from folks who want to use the photos of Rudy Delgado on posters and signs for the PRUP 2000 rallies, link their web sites to this photo, etc. I have checked with Del Hendrixson who has contact with Rudy's family and learned that everyone is free to use and distribute this photo in any way which may help justice be served for Rudy and for the others in his situation. 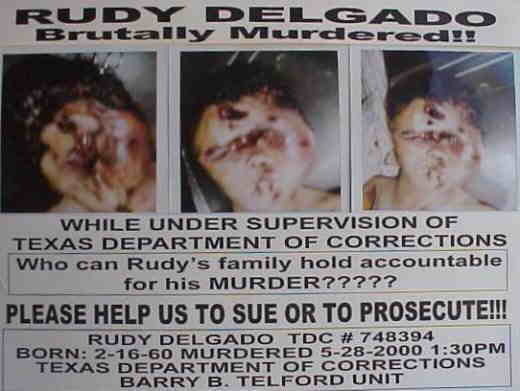 According to a news story about Rudy's murder, it was witnessed by 26 prisoners and two Correctional Officers. What was done to Rudy took time to accomplish. Why wasn't it stopped by the Officers? The fact that this atrocity occurred in front of two officers who let it happen makes TDJ as much responsible for his death and mutilation as the perpetrator is. The photos of Rudy demonstrate the dangers and horrors with which ALL our incarcerated loved ones live 24/7, and the apathy of the staff which permitted this to occur in their presence represents the level of protection they can expect if they are attacked by someone who has been made even more violent and angry by years of dehumanizing incarceration. With more than two million people incarcerated in America there are MILLIONS of us who are affected by the draconian conditions in America's prisons! TOGETHER WE CAN MAKE A DIFFERENCE!! Spread the word that PRUP 2000 is happening on July 15 and that EVERYONE needs to stand up and make their voices heard shouting that CONDITIONS IN OUR PENAL SYSTEMS MUST CHANGE! Let's make Rudy's death more than another senseless tragedy! Let's send this page out to everyone! Inform the people far and wide!